General Melchett:"Don't worry my boy. If you should falter, remember that Captain Darling and I are behind you." Captain Edmund Blackadder:"About 35 miles behind you." 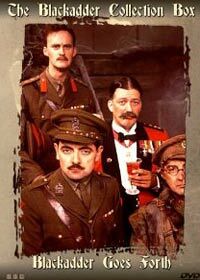 Captain Edmund Blackadder:"What begins with 'come here' and ends with 'ow!'." Captain Edmund Blackadder:"One thing puzzles me Baldrick. How did you manage to get so much custard out of such a small cat?" Lt. George:"Well cover me with eggs and flour and bake me for 14 minutes!" Captain Kevin Darling:"Good luck against those elephants." Captain Edmund Blackadder:"Lieutenant, that is a military map. It's unlikely to list interesting flora and fungi." Private Baldrick:"Funny thing is, my father was a nun." Captain Edmund Blackadder:"No he wasn't." Private Baldrick:"He was so sir. I know, because whenever he was up in court, and the judge used to say occupation, he'd say none." General Melchett:"Field Marshal Haig has formulated a brilliant new tactical plan to insure final victory in the field." Captain Edmund Blackadder:"Ah, would this brilliant plan involve us climbing out of our trenches and walking very slowly towards the enemy sir?" Captain Kevin Darling:"How could you possibly know that Blackadder, it's classified information!" General Melchett and Lieutenant George:"Row row row your boat, gently down the stream! Belts off trousers down! Isn't life a scream!" Captain Kevin Darling:"List of personal cleared for mission Gainsborough, as dictated by General C.H. Melchett. You and me Darling obviously. Field Marshal Haig, Field Marshal Haig's Wife, all of Field Marshal Haig's wife's friends, their families, their families servants, their families servants tennis partners and some chap I bumped into the mess the other day called Bernerd." General Melchett:"So its Maximum security is that clear?" Captain Edmund Blackadder:"Quite clear sir, only myself and the rest of the English speaking world is to know." Private Baldrick:"You know they say that somewhere there's a bullet with your name on it." Private Baldrick:"Well, I thought that if I owned the bullet with my name on it, I'd never get hit by it. Because I won't ever shoot myself."